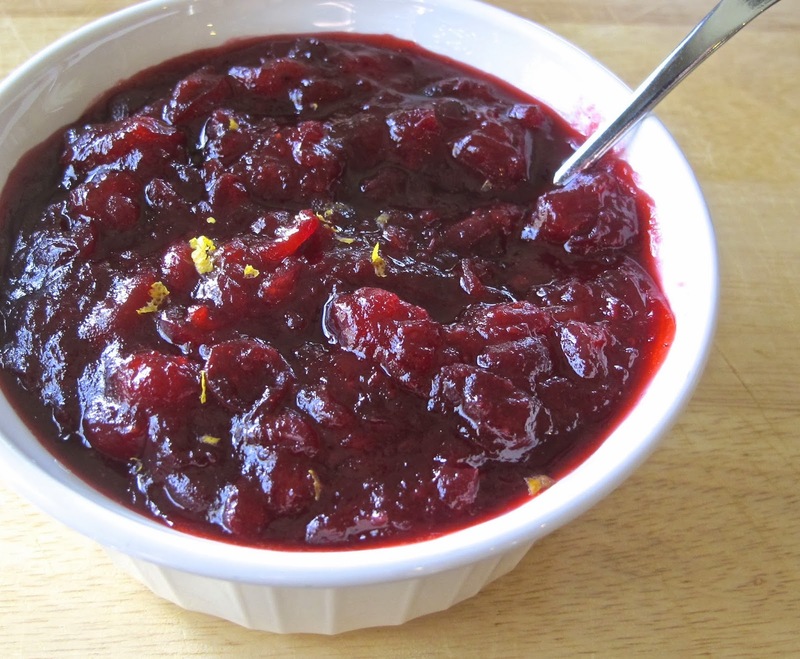 Cranberry sauce is a traditional Thanksgiving side dish. In a medium saucepan over low heat, combine the cranberries, orange juice, maple syrup, ginger, and sugar. Heat until mixture boils and cranberries begin to pop. Remove from heat and add in orange zest. Can be prepared several days in advance. Refrigerate until ready to serve. 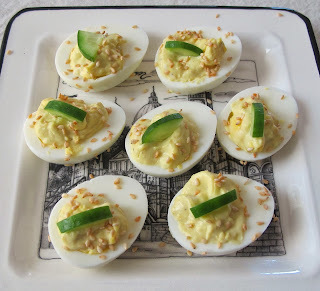 The classic deviled egg, a staple on any buffet table, is a blank canvas for adding a variety of flavors. The deviled egg is at home, in any season, and setting, from picnics to holiday bashes. Today we added a little heat by using a bit of wasabi paste. Topping the egg with a slice of Jalapeno pepper in place of cucumber, would bring the heat up even more. The most difficult part to me, is peeling the eggs. But, I found hard boiled eggs already peeled, in the refrigerator section of Trader Joe's. They were fresh and the egg yokes were a bright yellow, waiting to be transformed! Remove yolks from eggs and place in a bowl. Yolks can either be mashed with a fork or pressed through a sieve for smoother product. Add mayonnaise, wasabi, and salt and pepper. Mix well. Place egg mixture in a piping bag or plastic sandwich bag, cutting of the corner. Squeeze the egg yolk mixture into egg white "boats" and top with cucumber. Place on serving tray and sprinkle with toasted sesame seeds. 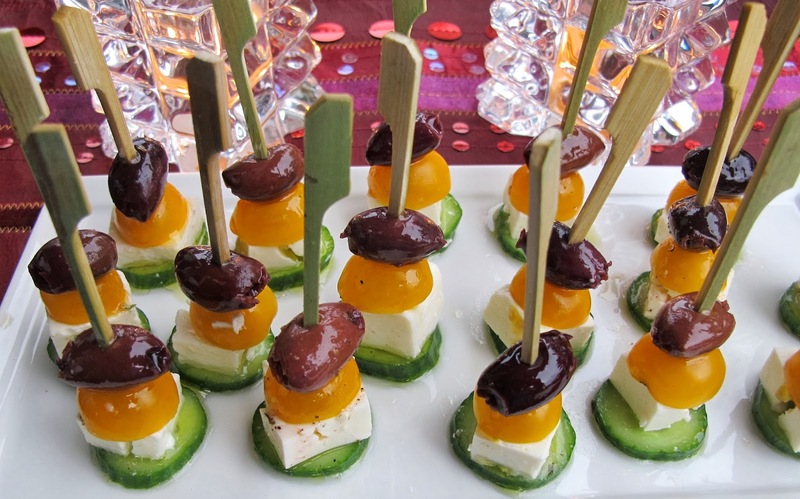 Greek salad on a skewer is an appetizer that would serve any holiday party. Whisk all together and drizzle over skewers, allow to sit a few minutes before plating for service. Take a slice of the cucumber as the base and top with a block of the cheese, tomato half and finish with the olive and put a skewer through all. Drizzle the dressing over top and then place on a serving plate. 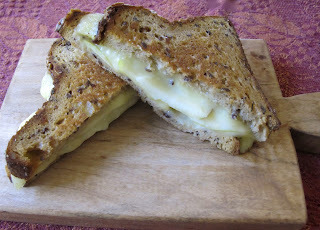 Mulling through the fridge, this struck me as the perfect grilled cheese sandwich for lunch. The always delightful Miss Ava, who is about 19 months old, loves cheese and apples. She would ask for "cheeth" with her nose crinkled and apples, her favorite meal. Slice Camembert and put on unbuttered side of bread. Top cheese with sliced apple and put together with butter side of bread out. Press together lightly. Grill over medium-low heat in a non stick pan, until cheese has melted. 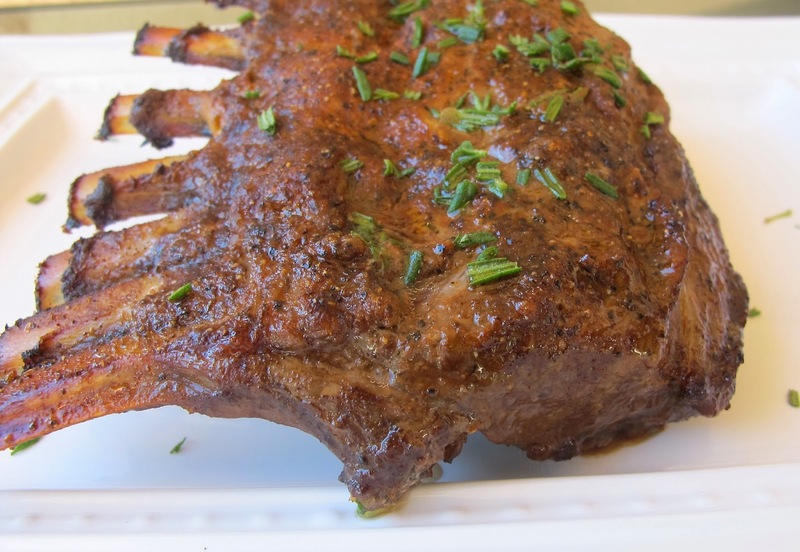 Rack of lamb is the perfect date night dinner. One rack will do two people. I marinated this rack about an hour before cooking. In a glass pan or gallon size freezer bag, combine the vinegar, mustard, olive oil, garlic, and rosemary sprigs. Add the lamb and mix well, let sit to marinade. Take lamb out and place on a roasting pan, discarding marinade. Cook about 20-25 minutes. Take out of oven and let rest about 10 minutes before carving. Sprinkle lamb with remaining fresh rosemary. This appetizer takes advantage of the Bartlett pears that are in season. The little Arugula salad, gives a peppery bite, with the sweet pears, all wrapped up in salty prosciutto. In a small bowl, combine arugula and 1/2 of lemon juice, toss with a few grinds of pepper. In another bowl combine sliced pears with the other half of lemon juice. 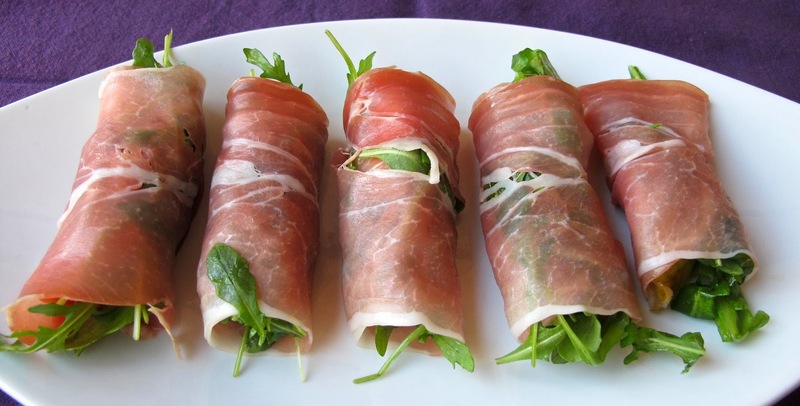 Lay a slice of prosciutto out flat, and at one end, top with slice of pear and about 1/4 cup arugula. Wrap prosciutto around and continue rolling, set aside. These are best served right away, but will hold in the fridge covered in plastic, until needed. 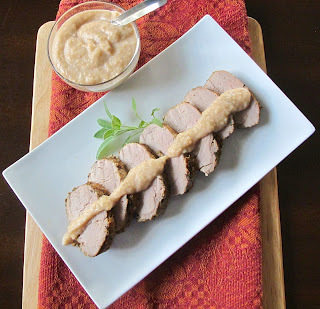 I recently made some fresh applesauce, Bake loves applesauce with pork. So after cooking a pork tenderloin I put this little sauce together to serve with it. If there are any leftovers, this would also be great in a sandwich. Whisk all ingredients together and refrigerate until needed. 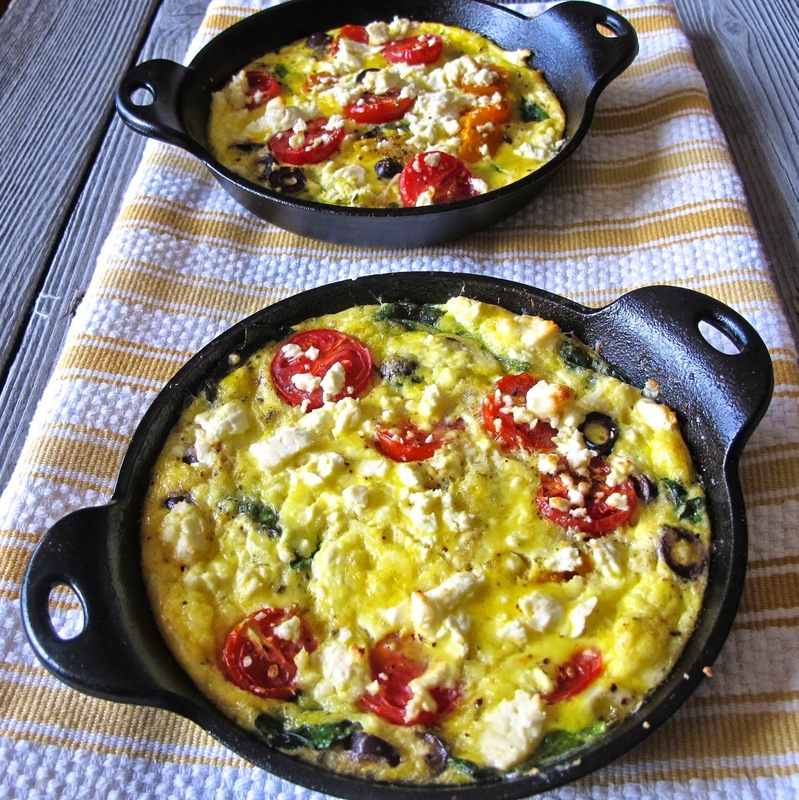 A frittata is one of the most versatile dishes, and can be made using the flavors from any ethnic cuisine. It can also be served for breakfast, lunch or dinner and also as an appetizer. Kodi recently served a hearty frittata, using Mexican elements topped with fresh homemade salsa, along side a platter of beautiful, seasonal fruits. It was a perfect fall lunch for conversing and watching a football game. There is also a salmon frittata in an earlier blog post. Today, I used little 5-6 inch cast iron pans to make individual frittatas. These can be served hot or cold, and for dining or picnic. Over medium low heat, put 2 teaspoons of olive oil in each small cast iron pan. Add 1 Tablespoon of onions into each pan and cook until softened. Layer the potatoes over top of the onions and sprinkle with seasoning. In a small bowl, beat the eggs, oregano, milk and pepper together. Pour over the potatoes and top with spinach, tomatoes and finish with feta cheese. Place in the oven and cook 20-25 minutes until eggs are cooked throughout. After a girls lunch overlooking the bay and a trip to the spa for pampering pedi's, how do you finish off the birthday celebration? Champagne! 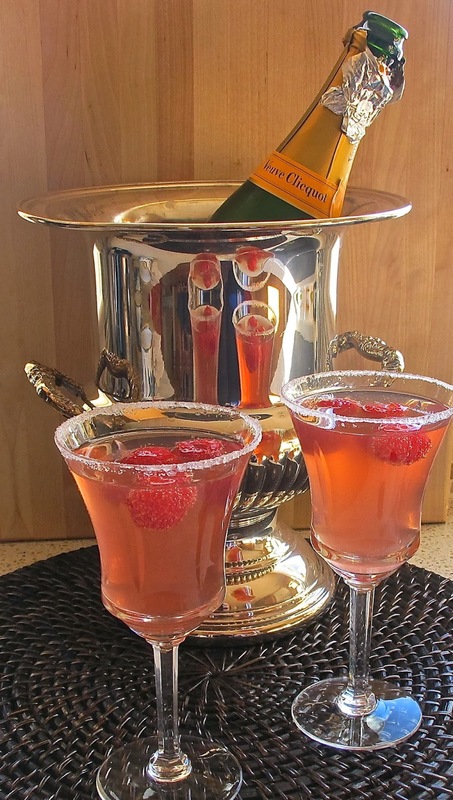 This champagne cocktail is going to be my festive winter cocktail this season. I used raspberries but cranberries could also be used. Also, sparkling apple juice could be used in place of champagne. With a little of the lime juice, wet the rim of the glass and then dip into the sugar. Divide the lime juice between the two glasses. Add 1 ounce of cranberry juice to each glass. 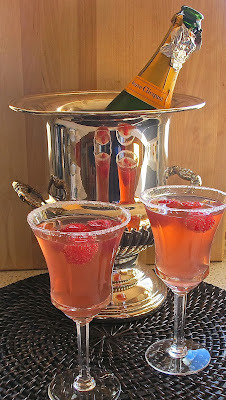 Add a few drops of Grand Marnier to each glass and then fill to the top with champagne. Serve right away, a Happy Birthday toast to you Lynn.